Did I just say restaurant? This is no restaurant. 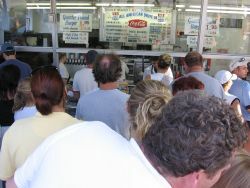 This is All American, a drive up hamburger stand that has been a part of Long Island life for over 40 years. Under continuous management by the Vultaggio family since its founding in 1963, All American is what MacDonald’s used to be: A good, high quality hamburger stand run by people who take pride in what they do and care about the food they serve and the customers that eat it. 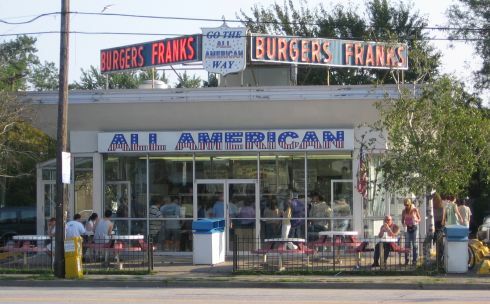 I’ve been enjoying All American for so long I don’t remember my first visit, but I do remember my friend Tom’s first visit. As we pulled into the parking lot he just looked at me with that “you’ve got to be kidding” expression on his face. All American is not the prettiest place around, so his reaction didn’t surprise me. His tune changed when we walked in and saw someone in the kitchen making french fries from fresh, whole potatoes. He was dumbfounded. I just smiled. All American’s fries are one of the things that keep me coming back. Dark golden brown and crispy on the outside, and tender, but not soggy on the inside they are the best fries you’ll ever have at a fast food restaurant. And this is fast food, folks. I’m not promising you a gourmet burger, not by any stretch. If you’re looking for gourmet, there are plenty of Long Island restaurants serving expensive gourmet burgers. All American is not one of them. What you do get at All American is simply one of the best fast food burgers around--Big, juicy and less expensive than the major chains. Hamburgers come in four varieties at All American: The Single, the Double Header, the Double Double (A Double Header with cheese) and the Quarter Pound hamburger. Cheese is optional for a small additional charge. My favorite is the Quarter Pound hamburger with cheese. That, with fries and a Coke and I’m set. Like most fast food restaurants to place your order you have to wait on line. The difference here is that the lines are usually out the door. Don’t worry; the ordering system at All American is fast and efficient. It won’t be long before you place your order and have your food. There is a small outdoor dining area, but unless the weather is nice and the place isn’t crowded (rare) plan on eating in your car. This is not a fault. Remember, All American is a drive up hamburger stand. In spite of the dining area, I’d still rather eat on the tailgate of my truck. It just more fun. In the age of mergers and takeovers, buyouts and sellouts, it’s not surprising that rumors of All American’s demise spring up from time to time. The last one circulating was about Wendy’s buying them out. No, it’s not happening. According to the owners All American is here to stay. And, they're not opening any new locations either (although sometimes I wish they would). 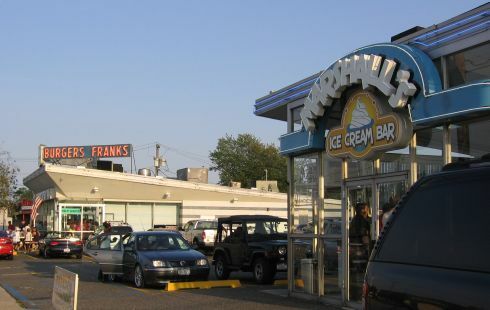 If you have room after your burgers and fries Marshall’s Ice Cream Bar (owned by the same family) is right next door. You won’t even have to move your car. All American – A great burger at a reasonable price. What more could you ask for? 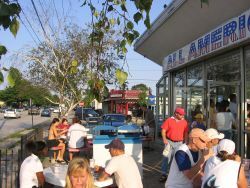 All American is located in Massapequa on the Southeast corner of Montauk Highway (Merrick Road, Rt. 27A) and Hicksville Road. (Rt. 107). Southern State Parkway East to Exit 29 (Hicksville Road) south. Continue about 2 ½ miles south. Turn left on Merrick Road and make a quick right into the parking lot. Southern State Parkway West to Exit 30 (Broadway) south.